Studying the history of Chinese and Japanese women provides American students with a thematic approach to Asian Studies. This paper reflects on the challenges I face in teaching women’s histories in China and Japan. It also discusses the pedagogy and sources I use in teaching the course. The paper argues that teaching the history of women in China and Japan will allow us to move beyond the conventionally regional or national focused approach to Asian Studies and enable us to re-imagine old narratives and to introduce students to new methods of understanding both the universality and diversity within Asian history. Li, Danke. 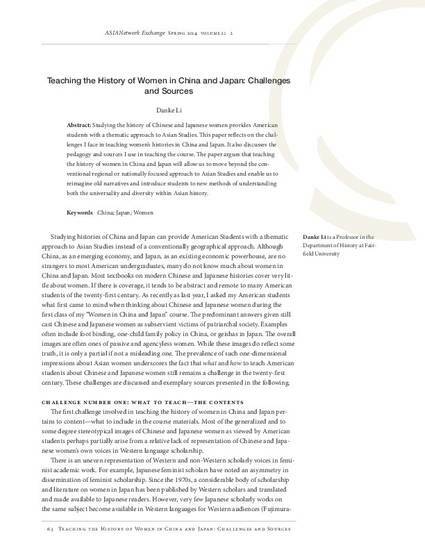 "Teaching the History of Women in China and Japan: Challenges and Sources." ASIANetwork Exchange: A Journal for Asian Studies in the Liberal Arts 21.2 (2014): 63-73.